Make your child the next mean, green, produce-cleaning machine! Smell, touch, clean, and talk about foods. 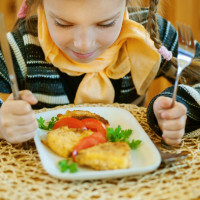 Involve your kids in the washing, cooking and serving process to increase their delight in different foods. Time for a food investigation! Let your child discover a new fruit or vegetable to bring home from the grocery store. I-Spy something green, leafy and crispy! …Or I spy something that begins with the same letter as you name. The produce section of the grocery store is an optimal opportunity to encourage excitement and discovery of different foods with a game like I-Spy. When it comes to eating fruits and veggies, think, “Do as I say and as I do.” Encourage food variety to your selective little one with your own colorful food choices. Have fun with fruit potions and fruit and veggie color charts!